The events leading up to the wedding of the season continued on New Girl Season 5 Episode 19. Jess has accidentally procrastinated on creating a beautiful dress for Cece and can't seem to find the alone time she needs to make it. Jess eventually enlists Schmidt's help and he is able to provide her with the perfect area to work on the dress – the bathroom at his work. Unfortunately, Schmidt's boss finds out what he has been up to and fires him for slacking on the job. Jess is able to offer a deal to Schmidt's boss by offering to get her kids into the school she works at. Jess reveals the good news to Schmidt, but is still disappointed she hasn't been able to work on the dress. Thankfully, after looking at the dress with a clear head, she realizes she can flip the dress inside out to create the perfect dress. Meanwhile, Winston and Aly attempt to keep their relationship a secret while at work. Aly plays pranks on Winston and vice versa, but they get caught by a fellow police officer who attempts to blackmail them. Aly eventually gets red up and announces her relationship with Winston to everyone. 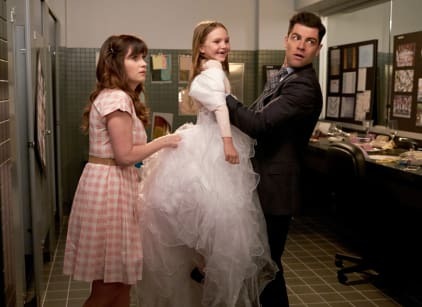 The wedding fun continued on New Girl Season 5 Episode 20, and Nick wanting to make sure Schmidt's father, Gavin, doesn't disappoint him. Nick tries to reason with Schmidt to not get his hopes up when it comes to his father, but Schmidt wants to believe he has changed. When Gavin shows up at the loft the men have a few drinks together and he promises to take Schmidt out for dinner the next day to discuss the wedding. While waiting for the elevator, Nick decides to have a conversation with Gavin and tells him he isn't allowed to disappoint Schmidt again. He tells Gavin he needs to be the father Schmidt deserves which Gavin agrees to. The next day, Schmidt becomes disappointed after waiting an hour for Gavin to show up. Nick eventually shows up to comfort his friend, but thankfully Gavin shows up explaining he stopped by the warehouse where the wedding was going to take place to get the deposit back. Schmidt is confused by it until Gavin tells him he is ready to make up for the years of disappointment and offers his vineyard as the place to have the wedding. Schmidt gladly accepts the vineyard as an early wedding gift. You still have time to catch up before the season finale! Go watch New Girl online now via TV Fanatic.